A very special leather spanking paddle with 5 acceleration holes. These are special openings to allow air to pass through the paddle slapper just prior to impact. Makes for a sharper impact on bare skin. Strictlyleather uses high quality heavy duty belting leather, two layers are combined to give a dense hard smooth finish on both faces to ensure a hard slap. A fine example of a fraternity and sorority initiation spanking paddle. Our handle is strenghened with an internal flexible support. Edges are sewn and a hanging loop provided for display. 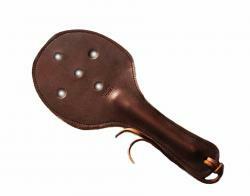 The paddle is versatile and can be used as a warm up implement or for serious punishments. Handle is 5 inches long...1 inch longer than US regulations for the handles for school use (old regs). Total and overal lengh of this paddle is 12 inches. Ideal over the knee bare bottom spankings and strict leather chastisement. Beware if imitations made by copy merchants.